The Gopis having kept the sacred dust of the Feet of Sri Radhaji upon their Forehead have attained their God of worship-Sri Krishna. Their worship of Radhaji has taken them to their Goal i.e. Sri Krishna. "Inexplicable is the Bhava (innate feel) of Sakhi, her mind won't prefer to play with Krishna." 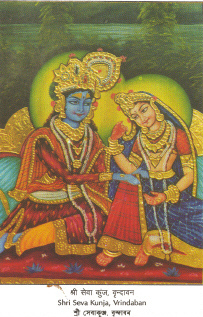 SAKHI'S GOAL IS SRI RADHA. HER ATTENTION IS ONLY ON THE LOTUS FEET OF SRI RADHA. Rasik saint during the course of his life on the Earth remains incessantly in the Bhav of Sri Radhaji. Many known and unknown saints of Vrindavan remained in the worship of Mahabbhavaswaroopini Sri Radhaji. Sri Radhika Prasadji Maharaj have acquainted us many such Great Souls of Vrindavan in his Eight Volumes of BRINDAVANESWARI SRI RADHA. Let us reminisce the glorious lives of such Divine Personalities.